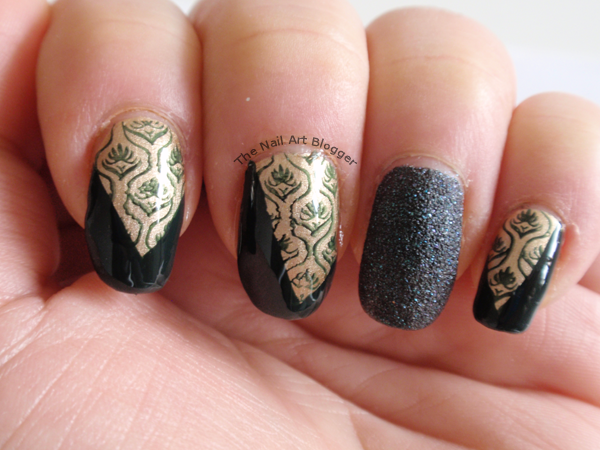 I also wanted to have an accent nail, because I really wanted to use one of my my sand-effect polishes. So, the thumb and ring finger got to be painted with the #090 opulent sand style polish by P2. On the rest of my nails, I started off with the #05 wonder wow! man! from the Superheroes trend edition by Essence as my base color, and I waited for it to dry completely. Once my nails were dry, I grabbed my stamping items and stamped the wallpaper pattern on my index, middle, and pinky fingers. For that I used the #160 deep see, baby by Essence. 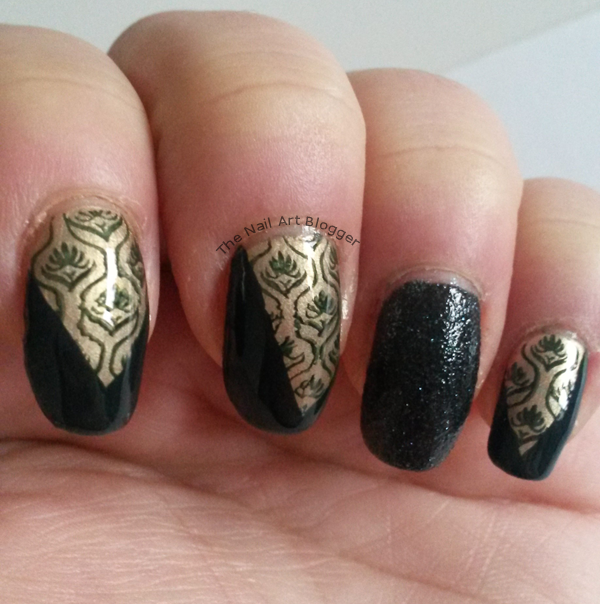 Initially I wanted to use black for the stamping, but then I had this itch to use another dark color. This dark green from Essence looks almost black, and under the sunlight it gives you the sliiiightest hint that it's actually green. I love that tricky little fellow. It's the same color I used for the stamping, by the way. 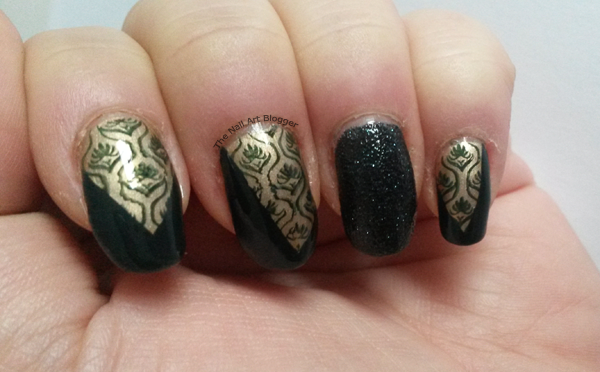 Naturally, the stamping design was too small for my nails, and a tiny bit short as well. So, I improvised... kinda. I just grabbed my striping brush, and using the same dark green, I added a couple of diagonal lines and filled them in. The index finger is a regular V-shaped french, I'm not sure if I can call the ones on the middle finger and the pinky french as well. It's more of a diagonal side swipe. But if you know, tell me, please! I love how the sand polish has this matte effect to it. The base is either dark green or black (I'm still not sure haha) and it has tiny green glitters in it. I love sand polishes with glitters. 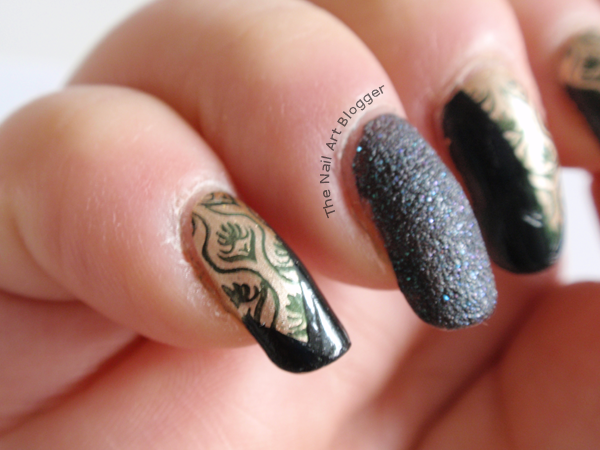 I kept it like that, and only added top coat to the nails with stamping. I used a sealing top coat from Essence. And today, when it was time to think of a new design, I decided to add a top coat to the accent nails as well, just to see how they would look like. I'll be honest, I didn't like them with a top coat. I'll stick to the matte version. I like it better when the green glitters shine brightly over the dark, matte background. How do you like your sand-effect polishes? With, or without top coat?